This Friday night ESPN will be in Utah for the intrastate battle between BYU and Utah State. Both teams head into this game at 1-3, but you can bet that this will be a very spirited battle. BYU has lost three straight games, and they haven’t lost four straight in a season since 17 years ago, when Utah State beat them, 58-56, in Logan. The teams meet once again on the campus of Utah State in what should be considered a chance for both teams to get their seasons turned around. The primary reason the BYU Cougars are 1-3 right now is their lack of production on the offensive side of the football. Freshman Jake Heaps is now the starting quarterback, but with the current personnel he doesn’t have too many weapons. The running game is good, with J.J. Di Luigi averaging 6.3 yards per carry on the season thus far. The passing attack has been extremely inconsistent, and the wide receivers haven’t been getting separation. The best weapon in the passing game has been Di Luigi, but the Cougars have to find someone to stretch the field and keep the defense honest. The Utah State Aggies have a terrific quarterback in Diondre Borel, but they are lacking in many other areas. Borel has a strong arm and usually airs it out quite often, but he does have the ability to beat you with his feet as well. The passing game hasn’t been able to get going so far this year. The offensive line is struggling, and that has led to Borel not having ample time to find open receivers. The Aggies haven’t been able to run the ball very well, and they are without last year’s leading rusher, Robert Turbin. Turbin tore his ACL prior to the season and is out for the year. The BYU defense has struggled mightily to stop the run this year. BYU is currently ranked 118th in the country in rushing defense. They are allowing 263 yards on the ground per game. The pass defense has been solid all year, a credit to their experienced secondary. BYU has just been beaten off the ball constantly this year, which is certainly not something Cougars fans are accustomed to seeing. If BYU is going to turn their season around, they must have improved play on their defensive front. The Aggies defense was absolutely chewed up in last week’s loss at San Diego State. They allowed 504 yards, including 362 through the air. The cornerbacks and safeties are inexperienced and will likely be a major weakness for this team all year long. The Aggies also struggle badly to pressure the quarterback, which puts even more pressure on the defensive backfield. Utah State has a nice trio of linebackers that roam around the field and disrupt the opposing offense frequently. The Cougars opened as 6.5-point road favorites, but the line has slowly been moving toward the home team in this matchup. BYU is now favored by 4.5 points at most sportsbooks. The posted total currently sits at 51.5 points, and there has been very little movement on it. BYU is 10-0 in their last 10 games against Utah State, but they are just 4-6 ATS in those 10 games. The Cougars are 2-7 ATS in their last nine games against teams with a losing record. 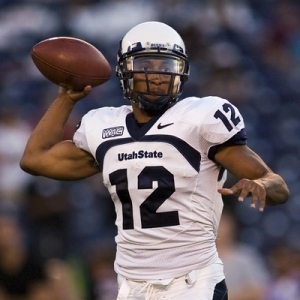 Utah State is 5-1 ATS in their last six non-conference games. The home team is 5-1-1 ATS in the last seven matchups between these two teams. The under is 4-0 in BYU’s last four games. The over is 5-2 in Utah State’s last seven home games. Both of these teams are currently playing very poorly. I think Utah State will be fired up for this game, because it is a rare chance for them to play in a nationally televised game. I’m counting on Diondre Borel to step up, and show just how good of a quarterback he can be. I think Utah State is the play as the home underdog in this contest. Doc’s Sports has become known in nearly four decades in the sports handicapping business as one of the brightest and most successful college football handicappers in the nation and Doc has a big Game of the Year in college going this weekend and this will be one of the highest rated picks of the season. This pick is out of the Big Ten, where Doc has become an expert since the early 1970s. Here ay Doc’s Sports we provide both college football picks and NFL picks in one package so you can get the best of both worlds for all your football betting needs. Check our homepage for up-to-the-minute college football odds and daily exclusive college football betting articles.